Try Our Taco Tuesday Catering Special! 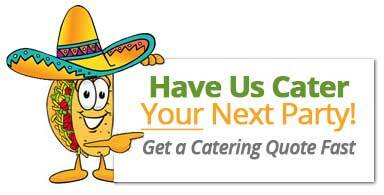 Hey Amigos Every Day is “Taco Tuesday” at Sacramento’s Best Taco Catering! Create your own authentic Mexican Fiesta complete with Jalisco Street Tacos. Our Taco Tuesday special provides enough food to feed all your friends and family. Try our Economy Drop Off Special – Only $299. Delicious Tacos Are On The Menu! FEED UP TO 30 FOR JUST $299! 30 Guests & Under, Standard Menu, Food Only. Dropped Off In Warm Trays! We Have Great Food & Great Service! Some catering businesses h ate Yelp! They’re terrified of Yelp and they should be. Yelp can make or break you and word of mouth travels fast. Yelp however, has been amazing for us. When you do the right thing so many times for so many different people, it’s reflected not only by the testimonials people leave for you, but by the smiles on the faces of our customers.